Leverkusen - Bayer 04 Leverkusen No.1 Bernd Leno learned the hard way that the world of goalkeeping can be a lonely place in Sunday's 1-1 draw with FC Augsburg. With the game only 12 minutes old, Bayer 04 defender Jonathan Tah played a straightforward back-pass to the 23-year-old to clear up field, only for the ball to take a bobble as he attempted his kick and trickle into the empty net. Leverkusen hit back and had ample chances to win it, but Lady Luck simply was not on their side. Speaking after the game, Leno relived his uncharacteristic error, discussed his recent call-up to the Germany national side and explained where die Werkself need to improve after the international break. Question: Bernd Leno, was what happened in the 12th minute one of those moments where you just want the ground to swallow you up? Bernd Leno: Yes, exactly that. My only thought was 'what’s happening?'. As a goalkeeper you draw the short straw. Of course it was a complete blackout on my part. The ball took an unfortunate bounce, I sliced it and in it went. There was no stopping it. These things happen unfortunately. Question: And that after receiving your first call-up to the national team. You must have pictured things differently. Leno: I don’t think a silly mistake will cost me. I’m delighted to be involved for the first time and I’ll try to show what I can do and, as always, perform. Question: This kind of thing happened to [international team-mate] Marc-Andre ter Stegen. Will there be a few jokes about it? Leno: Quite possibly. As footballers, we’re pretty easygoing behind the scenes. I’m also not the first it’s happened to. I’ll probably have to put up with a few jibes and maybe I'll be able to laugh about it in a few days. Question: Can mistakes like that be attributed to the quick game goalkeepers play these days? You could just as easily have put your foot on the ball. Leno: I think an opposition striker was closing in. In general, every Bundesliga goalkeeper has to be prepared to launch the ball up field whether it's first time or after taking a couple of touches. It doesn’t have anything to do with modern goalkeeping. Question: How difficult was it for the team to come to terms with the setback? Leno: It’s never nice to concede, but we got better and better as the game went on. Luckily, we equalised before half time. We played brilliantly in the second half, but once again we didn’t get what we deserved. Question: Augsburg wouldn’t have scored without a helping hand, would they? Leno: There’s no way they’d have scored. That’s why it’s doubly hard to take that we weren’t able to win, despite creating some great chances. Question: How do you explain that? Leno: We had opportunities right up until the end, but perhaps we were missing a cutting edge and maybe a bit of luck. 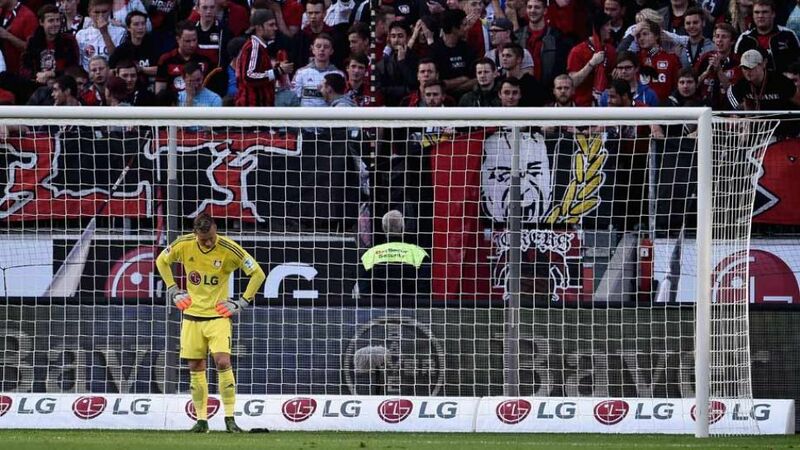 First, Lars Bender hit the post, then Hakan Calhanoglu slipped as he took the penalty. You can’t blame the lads for that. Hakan is obviously disappointed like everyone else, but it’s not just down to him that we didn’t win. Apart from that, he had a really good came and, after missing the penalty, he forced a save from Marwin Hitz with a fantastic free-kick. Question: Leverkusen go into the international break in seventh place. Is that a fair reflection of your performances? Leno: I think we deserve to have more points. Our objective today was to close the gap on the top four because that’s where we belong. To do that, however, we have to take our chances.